Computerboy.com | Ramblings of a nerd…. Backing up has gotten a lot easier in the last 5 years – between the price of storage coming down drastically and the manufacturers of both the OS and backup software making things so very easy, there’s almost no excuse to NOT backup anymore. For Macintosh users, all you really need is an external hard drive – Mac OS X 10.5 Leopard and above includes Time Machine, which will automatically backup your computer for you. You set it up once, and hopefully never use it again. If you do need it, it’s fairly easy and straightforward – replace a file you deleted by accident or replace your whole hard drive, the only variable is the amount of data, and therefore time that it will take. I’ve had to use this method for customers, and it really is easy. For PC users, Windows Vista and Windows 7 have also come a long way in ease of use. Starting with Windows Vista, there’s been a built-in backup tool which is akin to what Mac OS X offers – you set it up initially (what drive to backup to, which files, etc) and then you don’t have to worry about it. It’s so easy to back up your computer now that it’s almost embarrassing to NOT backup. Whether it’s plugging a hard drive into your computer and letting it do the work or using an online service, it’s literally never been easier to get your computer backed up. If you need help with this, I’m always available. If you know me at all, you know that I hate Windows. I use it, I install it, and I support it – but I hate it with a passion. Something I hate more than Windows, however, is spyware/adware/virii, and the damage they can do on a PC. For example, some actually make a point to disable your computers internet access – I guess on the principle that if you can’t get online, you can’t get the virus off. Or something. It doesn’t make a lot of sense. I ran into a situation recently where this happened, and I thought I’d share what I did to get out of it – it was a royal pain, and it wasn’t easy to figure out. One mans 2 hours of searching is another’s search result, so…..
1. Boot the computer into Safe Mode (F8 at startup, after the BIOS messages (usually when you see the manufacturers logo) and before Windows starts up. Select Safe Mode in the list. 6. Right-click Winsock, and then click Delete. When you are prompted to confirm the deletion, click Yes. 8. Right-click Winsock2, click Delete, and then click Yes. Reboot the computer. Cross your fingers. BUY ANTI-VIRUS SOFTWARE. Posted in Uncategorized	| Comments Off on An operation was attempted on something that is not a socket. Have WiFi at home? Frustrated by weak spots in your coverage? Check out the Ez-12 Parabolic Reflector Template. Print it out, cut/fold/insert as instructed after you put the aluminum foil on it, and enjoy the fast, free, and fairly simple upgrade to your wireless network! An investigation into the ongoing trademark dispute between Cisco and Apple over the name “iPhone” appears to show that Cisco does not own the mark as claimed in their recent lawsuit. This is based on publicly available information from the US Patent and Trademark office, as well as public reviews of Cisco products over the past year. The trademark was apparently abandoned in late 2005/early 2006 because Cisco was not using it. They had six years, and they wasted it. They managed to keep it by using a window of six months where they can still keep it if they pay an extra fee. But if you look at the photo, you’ll see that the “product” they were selling is just one of their VoIP phones with an “iPhone” sticker put onto the shrink wrap. This information indicates that Cisco did not actively offer a product named “iPhone” between 1999 and December 2006. What is also interesting is that Apple knew that they had the name and were apparently still negotiating with Cisco until Monday night, literally hours before the iPhone was announced to the public. It would seem that Apple might have known about the fact that Cisco had scrambled to keep the name at the last minute, so they might also know that they can get the USPTO to void Cisco’s registration – freeing up the name for the next company in line to use it, Ocean Telecom Services LLC – a company regarded by many to be a front for Apples attempts to get the iPhone name. Either way, things should stay interesting for a while. Posted in Uncategorized	| Comments Off on Cisco vs. Apple: Cisco will lose? Try going to this URL. Does it look familiar? I don’t know who’s doing it, or why, but I am curious. Please send me an email to explain yourself. Posted in Uncategorized	| Comments Off on What is going on here? Having been an Amazon associate for quite some time, I was quite pleased to discover that they now offer Amazon stores. I’ve taken the liberty of creating my own store and started to fill it with computers, gadgets and other fun things. I plan on doing some expanding to the list this weekend. Enjoy! Posted in Uncategorized	| Comments Off on Store now open! Skylar and her friends discover that the government has also blocked all IP addresses on the internet when she tries to check her email to see whether her parents may have left her a message. I think that this actually possible – and quite useful. If something on the scale of “Jericho” actually happened, I don’t think it would be a big deal to have the DNS changed in some way to point everyone to a specific website (or more likely a bunch of mirrored sites) that could be used to relay information. Considering that several of the top level DNS are located in the US, it makes it more plausible that this could – and, if it hasn’t been considered, should – happen. Realistically, they could use this to redirect ALL web traffic to one place, so why not do it? Posted in Uncategorized	| Comments Off on Truth in Fiction? I’d always wondered what each level of permissions was, exactly – and now I have a handy reference. What’s the expression? A day late and a dollar short? Well, I’m a couple dollars short, and several days late. Sorry. But here it is anyway…. The trip to the WWDC has been interesting. I’ve never been before, so it was bound to be an interesting experience. The flight from JFK to SFO was mostly uneventful, except for taking quite a bit of time to get off the ground – I was worried about the amount of fuel we were using just sitting on the tarmac. Not my problem, as I’m not the pilot…. Anyway. 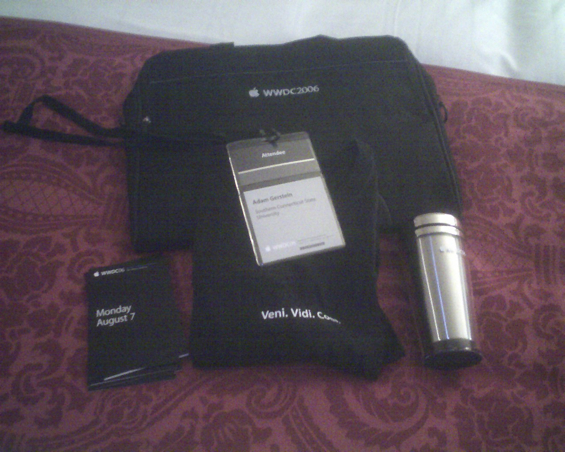 Once I got to San Francisco and got settled into the hotel (the Renaisance Parc 55), I ran over to Moscone West to get my credentials for the show – a badge and schedules for the different sessions – as well as my attendee gifts: a nice laptop bag, a t-shirt and a coffee cup. Sunday night was a “MacEnterprise” gathering – it’s a mailing list for people who manage Macintosh computers. We met at the Thirsty Bear, which had us up on the second floor. It turns out that Apple decided to sponsor the event – which was quite nice. I sampled a couple of their micro-brews – they were very nice. I also enjoyed the company of my fellow geeks while we had some very tasty appetizers. 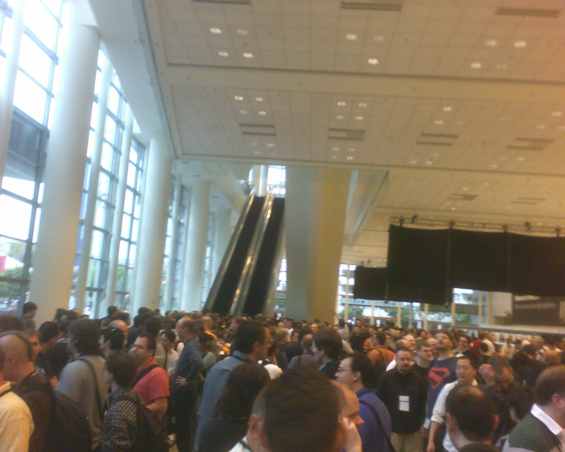 The morning of the keynote, I was up at 6:00 so I could make my way to the Moscone center to attend. The Keynote wasn’t scheduled to start until 10:00, but apparently people start lining up at about 6:00 and earlier. My biggest concern was making it so I could get into the main room to watch the keynote “live” instead of in an overflow room and watching it on the big screens. 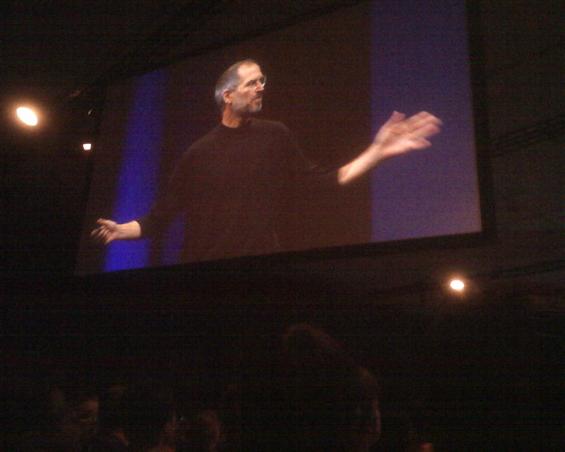 It would have been the same either way, but there’s just a little something more “fun” about being in the same room as Steve and the keynote. You’ve probably read or heard about the announcements, so I won’t go into any detail about them – except to say that I was quite pleased to hear about some of the new stuff in Leopard, and I loved hearing that there is new hardware coming. 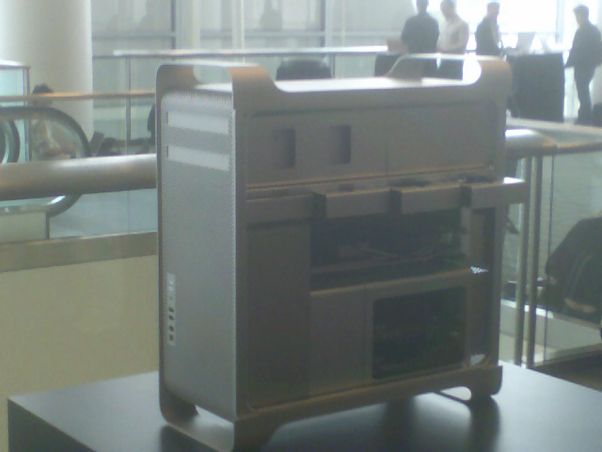 The new Mac Pro looks awesome – I had a chance to look at the new boxs at the show, and they’re very cool. The expansion to 4 drive bays and two optical drives is nice, and the overall flow of the machine is much nicer. The addition of 64-bit processing and subsequent changes in memory – up to 16 gb – is going to make some computing applications very fast. Some of the technologies built into Leopard are very cool – TimeMachine, for example, is going to make many System Admins very happy, since it lets the users backup their own data, as well as restore it at will. This alone will prevent more than a few headaches on my campus.